SCHAUMBURG, IL--(Marketwired - May 13, 2014) - Omron Electronic Components honored Digi-Key Corporation with the 2013 Distributor of the Year award at the Electronics Distribution Show in Las Vegas, Nevada on May 7, 2014. Presenting the award to Digi-Key President Mark Larson were Omron Electronic Components' Jeff Rogers, President and Chief Operating Officer, and Kris Whitehouse, Director of Sales Solutions. 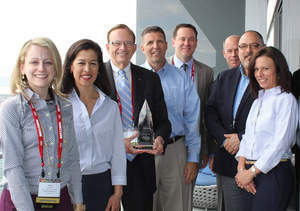 Digi-Key was recognized for their outstanding global sales performance in 2013, inventory breadth and depth, best-in-class sales support programs and marketing initiatives, as well as local and corporate focus on the Omron line. Rogers said of Digi-Key's award, "Omron Electronic Components is delighted to present the Distributor of the Year award to Digi-Key. Digi-Key had a very successful 2013 with Omron, and we are grateful to the entire Digi-Key organization for the demonstrated commitment to success with Omron. We look forward to building on the successes and partnership reached in 2013 for years to come." "Throughout the tenure of our relationship, Omron has been a valuable partner with our company," said Tom Busher, Vice President, Global Interconnect, Passives, and Electromechanical Product at Digi-Key. "Being named Distributor of the Year provides undeniable validation of our efforts to promote their quality products to our worldwide customers. We thank Omron for this award and look forward to continued mutual success in the future." For over 80 years, Omron Electronic Components has been a leading manufacturer and provider of advanced electronic components. Extensive product groups include relays, switches, connectors, MEMS flow sensors, pressure sensors, and optical components. Omron Electronic Components is the Americas subsidiary of Omron Corporation, a $7.6 billion global leading supplier of electronics and control system components and services. Omron's broad product offering can be found in applications for the communications, transportation, medical, HVAC, appliance, industrial automation, consumer electronics, test and measurement, and gaming markets around the world. Omron Electronic Components has an extensive sales support network consisting of Sales Professionals, Inside Sales and Customer Service Representatives, Technical Sales Assistants, and an authorized distributor network.